It has been two weeks since the first of the so-called "Roux-ga-roux" murders was reported, and while the police have not yet made any arrests in the case, the murders have garnered the attention of at least five investigators from out of state. 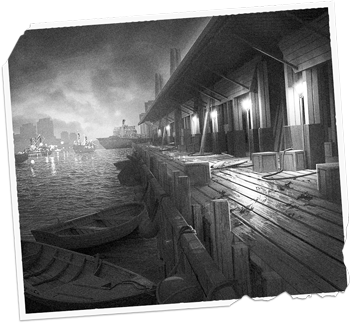 Led by Federal Agent Roland Banks, these investigators arrived yesterday from Arkham, Massachussetts, claiming they saw connections between the recent killings and a recent string of disappeared individuals they had been investigating in Arkham. According to police Captain Marcel LaForte, the investigators and their inquiries have been stirring unrest among many of the more superstitious residents of the French Quarter. LaForte said these investigators have not yet violated any laws, but their arrival has led to an increase in the number of complaints and anonymous reports the department has had to field. 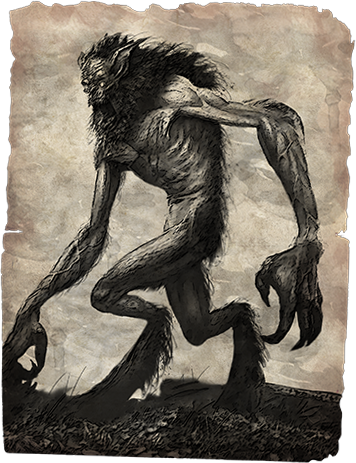 Accordingly, he warned citizens to take their questions about The Curse of the Rougarou with a good measure of skepticism, reminding people that the police had already investigated and dismissed the rumors that had connected the recent string of killings to Voodoo influences. A police sketch of the notorious "Roux-ga-roux"
It is clear, however, that the Captain's words have not resonated with the local population as fully as he would wish. Like many residents in the French Quarter, local store owner Jean Gris spoke of the power of Voodoo. "I don't know if it's Voodoo," he said, "but there are powers that the police don't always understand. It concerns us that they allow these murders to go unresolved just because they don't understand how they were committed. I believe there are many in the police who have their own religious faiths, so it's hard for me to understand how they can believe in some spiritual powers and not in others. In the meantime, our sons and daughters, brothers and sisters, mothers, fathers, and grandparents are walking the streets every day, and there's still a killer at large." Gris' words were echoed by those of the Reverend Father John Knowles, who said, "A few members of my congregation were among those who discovered one of the bodies. That discovery really shocked them, and they want answers. They're not happy with the police department's progress. While I don't necessarily see a place in the scriptures for the phenomena that Agent Banks suggested were connected to this Arkham Horror: The Card Game, I can appreciate their exploration of spiritual possibilities. The spiritual realm is real, and there is real evil in this world." Surprisingly, while the "evil" nature of the murders appears to be the one thing that most of New Orleans has agreed upon, Agent Banks and his associates urged a more philosophical approach. "We are withholding judgment at this time," said Agent Banks. "The first thing to do is to gather evidence. Only then will we start to form a larger picture. From what I've seen, I'm not certain these killings were even murders. There is much about them that is animalistic. And there's still more that remains unexplained. My colleagues and I are looking into some of the leads we feel the local police may have overlooked, and we hope to come into some answers shortly. For now, we are focusing on the reports from local citizens and trying to meet with a local expert who may be able to provide greater insight." Solomon's Wharf is the site of the most recent "Roux-ga-roux" slaying. Agent Banks refused to say whether or not he and his colleagues were giving any serious consideration to the early eyewitness accounts of Tom Jardin, who had still been inebriated when the police discovered him lying in a nearby alley hours after the murder. It was Jardin's description of the killer that had first led to the idea of the "Roux-ga-roux," whom Jardin had claimed reeked of the bayou and "dark magic." As for the direction of Agent Banks' investigation, The Daily Sun was able to gain greater insight from one of Agent Banks' fellow investigators, a librarian by the name of Daisy Walker. She said her speciality lay in obscure tomes of occult knowledge, and she told us that the investigators were hoping to meet with a "Lady Esprit," a Voodoo priestess said to reside in the bayou nearest the first and second murders. When we relayed this information to Captain LaForte, he said only that he was glad they wouldn't be inciting any more superstitions in the French Quarter. Then he chuckled and said he hoped they packed their galoshes. A standalone scenario for Arkham Horror: The Card Game, Curse of the Rougarou is now available via FFG's in-house manufacturing. It can be played as a self-contained scenario, or it can be inserted into your larger Arkham Horror: The Card Game campaign as a side-story that costs one experience to begin and allows your investigators to brave untold dangers as they pursue a monstrous killer through the streets of New Orleans and the bayous of southern Louisiana. 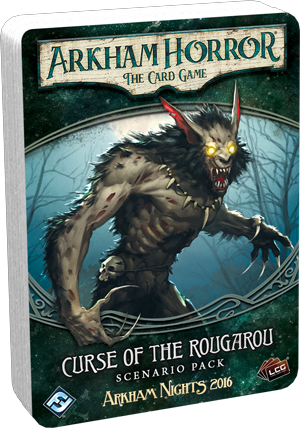 Curse of the Rougarou is a deck of sixty-two cards, including a complete Arkham Horror: The Card Game scenario, rules, and two player cards—one asset and one weakness. It is now available on our webstore.